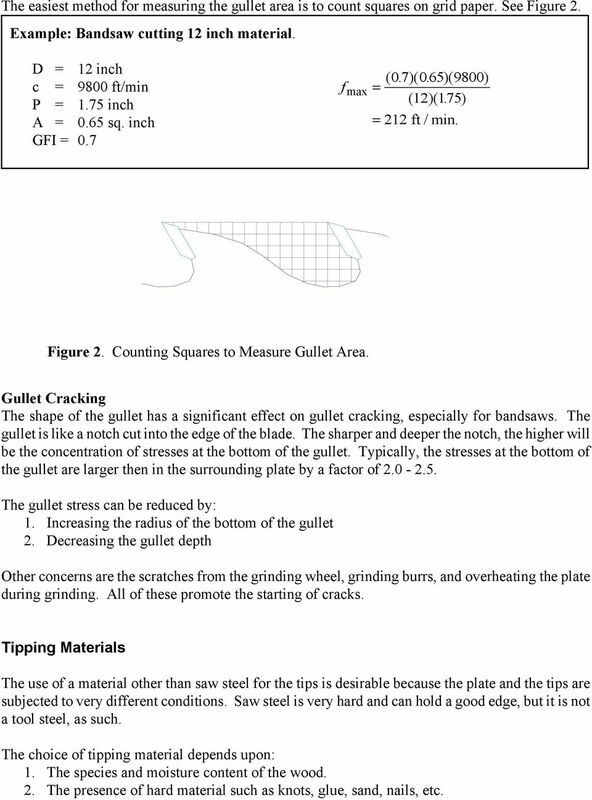 Download "Saw Tooth Design and Tipping Materials"
3 The easiest method for measuring the gullet area is to count squares on grid paper. See Figure 2. Example: Bandsaw cutting 12 inch material. D = 12 inch c = 9800 ft/min P = 1.75 inch A = 0.65 sq. inch GFI = 0.7 ( 0. 7)( 0. 65)( 9800) f max = ( 12)( 175. ) = 212 ft / min. Figure 2. Counting Squares to Measure Gullet Area. Gullet Cracking The shape of the gullet has a significant effect on gullet cracking, especially for bandsaws. The gullet is like a notch cut into the edge of the blade. The sharper and deeper the notch, the higher will be the concentration of stresses at the bottom of the gullet. Typically, the stresses at the bottom of the gullet are larger then in the surrounding plate by a factor of The gullet stress can be reduced by: 1. Increasing the radius of the bottom of the gullet 2. Decreasing the gullet depth Other concerns are the scratches from the grinding wheel, grinding burrs, and overheating the plate during grinding. All of these promote the starting of cracks. Tipping Materials The use of a material other than saw steel for the tips is desirable because the plate and the tips are subjected to very different conditions. Saw steel is very hard and can hold a good edge, but it is not a tool steel, as such. The choice of tipping material depends upon: 1. The species and moisture content of the wood. 2. The presence of hard material such as knots, glue, sand, nails, etc. 4 3. Cost of tips, sharpening and re-tipping. Wear Mechanisms The environment of a saw tooth is severe. The tips impact the wood at a speed of about 10,000 ft/min (50 m/s) and temperatures at the surface of a tip have been measured to reach 700 C. The wear mechanism for each tip material is different. There are two mechanisms of wear: 1. Abrasive wear resulting from the chip flowing across the face and back of the tooth. Glues used in composite wood products are very abrasive, and some species, like teak, contain silica. 2. Corrosive or chemical wear resulting from the reaction of water and other chemicals in the wood with the tipping material. Some species, such as western red cedar, have an acid that is very corrosive. The higher the moisture content, the greater will be the component of chemical wear. These two wear mechanisms occur together in varying proportions, but research is showing that chemical wear is involved more than was expected. Material Structure The structure of the tip material affects its wear resistance. 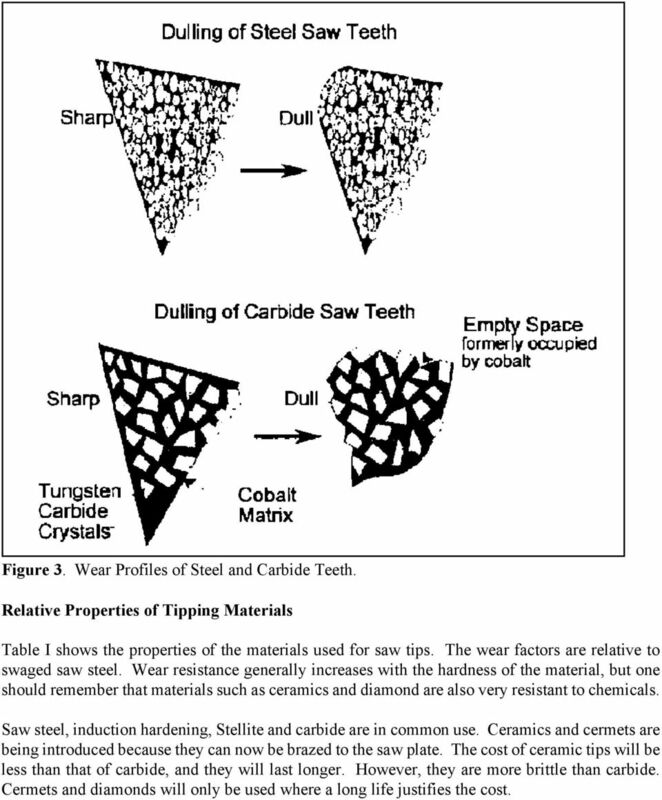 Figure 3 shows the typical wear profiles of steel and carbide tips. A dull steel tooth has a smooth, round wear pattern, however, for carbide, the surface is uneven. Carbide is composed of very hard tungsten carbide particles held together with cobalt. Since the cobalt is much softer and more prone to chemical attack than the tungsten carbide, the wear mechanism is for the carbide particles to break off after the cobalt has receded. When cutting wet western red cedar, the acids quickly remove the cobalt so carbide tips wear very quickly for this species. Stellite is a better material for cutting wet cedar because it is an alloy of cobalt and chromium, with no chemically free cobalt. Although Stellite is softer than carbide, it lasts twice as long when cutting wet cedar. 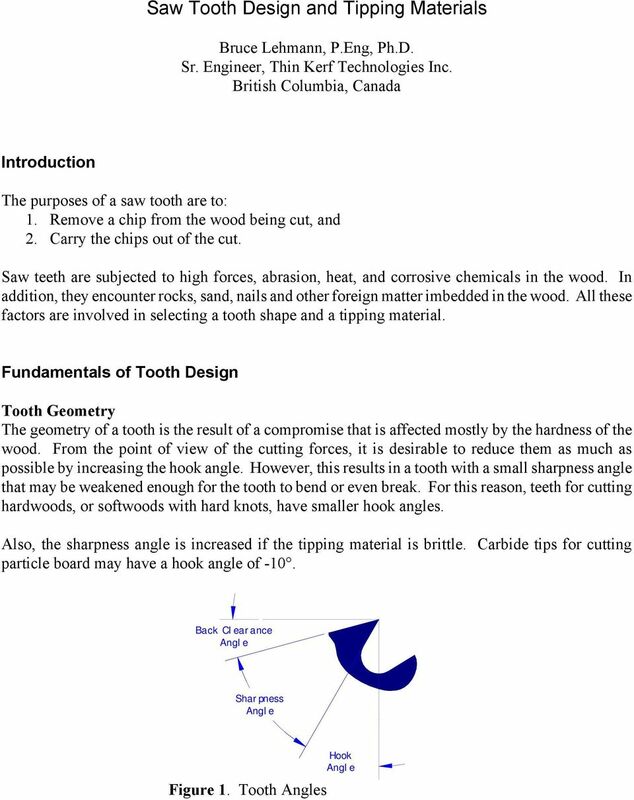 However, carbide is superior when cutting dry cedar because the amount of chemical erosion is less. Although high strength is a desirable property for a tipping material because it makes the tooth more resistant to abrasive wear, it also results in a tooth that is more brittle. This means that the tip will chip or break more easily from either careless handling of the saws or from hitting knots or sand in the wood. For this reason, headrig saws, which make the first cuts into a log, still use steel teeth, because they are more robust and easier to repair. On the other hand, it is unlikely that diamond tips will be used for log break down because they would chip off long before they were dull. 5 Figure 3. 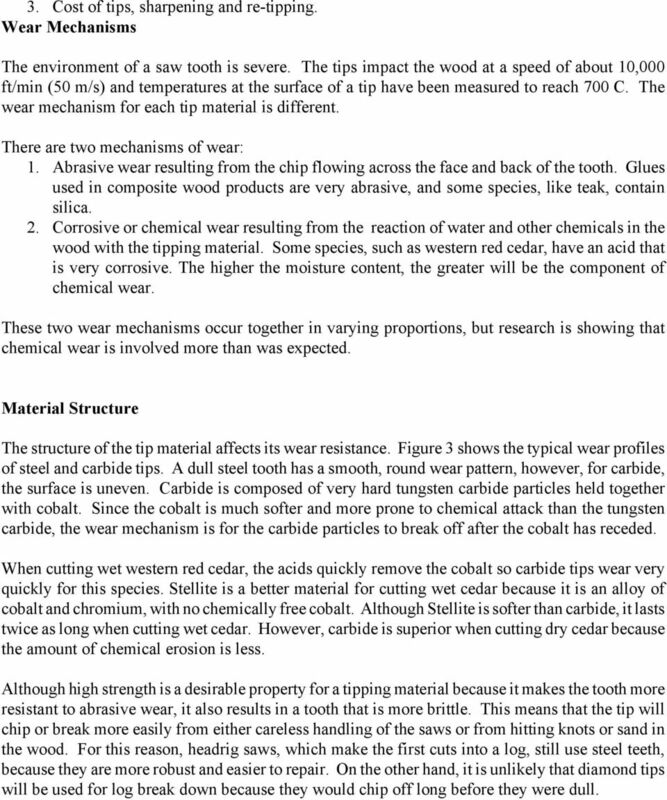 Wear Profiles of Steel and Carbide Teeth. 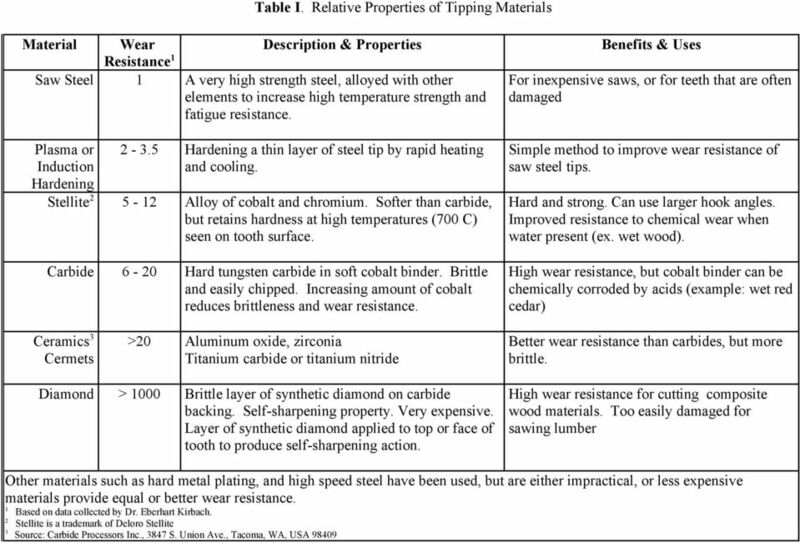 Relative Properties of Tipping Materials Table I shows the properties of the materials used for saw tips. The wear factors are relative to swaged saw steel. Wear resistance generally increases with the hardness of the material, but one should remember that materials such as ceramics and diamond are also very resistant to chemicals. Saw steel, induction hardening, Stellite and carbide are in common use. Ceramics and cermets are being introduced because they can now be brazed to the saw plate. The cost of ceramic tips will be less than that of carbide, and they will last longer. However, they are more brittle than carbide. Cermets and diamonds will only be used where a long life justifies the cost. Economy Sharpening Let s briefly look at the various media available for honing and grinding: Honing media. 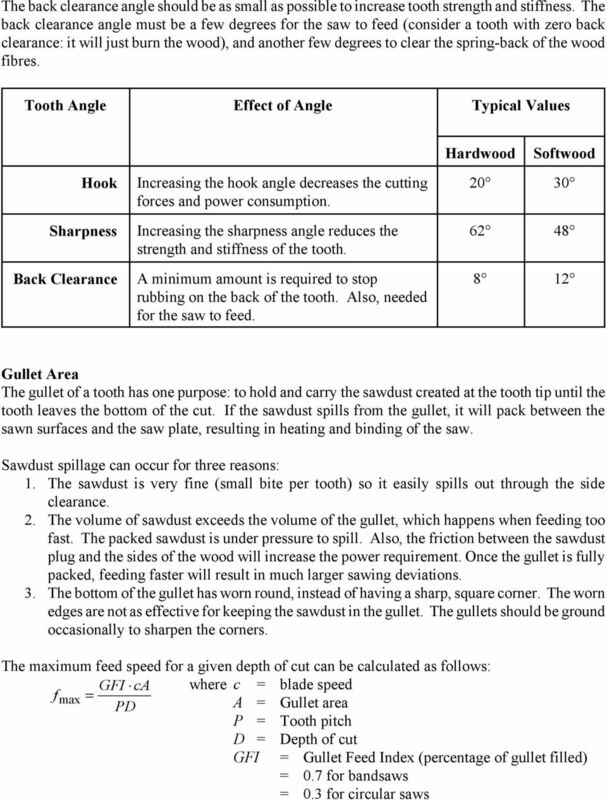 The Sharpening Process and Methods That Work By Don Naples Wood Artistry, L.L.C. Knife. Removing lots of material using a machine. glass carving knife bench stone honing compound g n i n e p r Sha t h g i A Stra Knife What is sharpening? We define sharpening as, creating a shape, and polishing it - all of which is done with abrasives. Meet the new freud. New Products: Innovations as well as heavy investment in up to date technology in the plants for superior product quality. LOCALIZED CORROSION OF CAST ZR 702 By Thomas C. Spence & D. Scott Reed ABSTRACT There have been a few specific services where random, unexplained, localized corrosion of cast zirconium equipment has occurred. With all this in mind, let s now look at some of the things that can go wrong with the sharpening process. Introduction A sharp knife is a joy to work with but it is very scarce in many kitchens.